Recently, at the Tour De Chhattisgarh, we happened to have a chance to ride, stay and interact with a bicycle tourist from Switzerland, Guillaume Berney. At the young age of 25, Guillaume decided to quit his job and explore India solo on his touring bicycle. 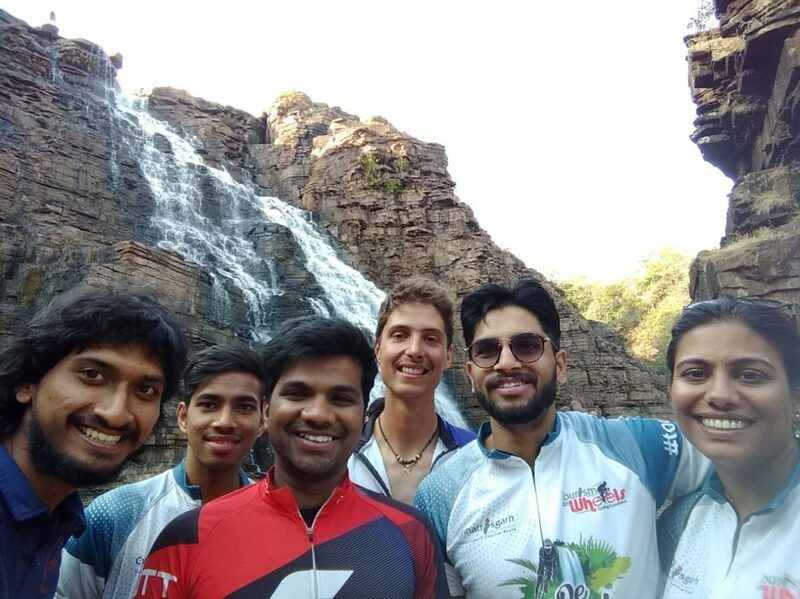 After spending a few months in the southern part of India, Guillaume happened to get contacted by one of the organizers of the #TourDeCG who invited him to pedal with dozens of cyclist across Chhattisgarh. I wanted to discover a different culture and other life values. The reputation of India for food, festivals, population and religions surrounded in my head. The intensity and surprising side of the life here waked up my adventures nature. There was also a part of a challenge in cycling throw such an overcrowded country. Which is your favourite city/place in India? As a mountain lover, I was really enjoying Kodaikanal and the region of Wayanad. I also loved the peaceful sandy beaches and backwaters of Cherrai. What do you love about cycling and cycling trips? I love to be free to go anywhere at any time. It makes you feel as the world would have no borders. Cycling is still a non-common way of travelling, so it’s a chance to get in touch with a lot of people. What made you want to go for #TourDeCG? I have been luckily invited as I get in touch over Warmshower (cycling hosts community) with the Tour De Chhattisgarh organizer. I was interested to meet people and discover the wild places of Chhattisgarh in a comfortable way. Do you have any favourite memories from this tour? I would say, good moments with other people are the best memories. Without a doubt, the funny times with my roommates were the best moments. Also, the applause and the songs of the many children’s along the road were very intensive moments. And as a foreigner, I loved to watch the tribal dance of the villagers. Which is the must-visit location in Chhatisgarh? I loved to stay at Gangrel, right next to the lake. We were swimming in the evening by sunset and the next morning we enjoyed breakfast by sunrise just next to the lake. Do you have a favourite photo from this tour? What is one moment from any cycling tour that’s really stuck with you? As I was in south Karnataka in the coffee plantations, I was looking for a place to put my tent for the night, which was very difficult in this area. That’s when a teacher offered me to stay at her home. Her family welcomed me like a prince and I slept in the main room with her uncle and cousin. If you could lead a cycling tour anywhere in the world (or just go on one), where would it be? Mountain biking through the Alps is one of the nicest tours you can do. However, at least you only need one track and nature to have fun on the bicycle. Actually, I am cycling in Madhya Pradesh. After I will go to Rajasthan, Uttarakhand and leave India for Nepal. I’ll stay a few months there for volunteering and then travel by train through China, Mongolia and Russia until Moscow. I’ll cycle from there for two more months back to my home in Switzerland. My journey through India is my first cycling tour and it has wakened up the hunger for more cycling tours in me. My next big project will be to cycle from Switzerland around the Black Sea and the Caspian Sea. I would travel through the Balkans, Turkey, Caucase, Iran, Turkmenistan, Kazakhstan, Russia and Eastern Europe countries. What did you love the most about the tour? I loved the tasty food buffet, where I was every time eating without restriction. The accommodation were at very nice places and comfortable so that we could relax after a long tiring day. How do you think the tour can be made better? The time schedule should be better respected and start at 8 am in the morning would be early enough. I would also prefer to not have to take the bus for going on tour as I prefer riding. In this way, a tour with wild camping could be interesting for adventurous people. What made your tour so special? I think the participants made my tour so nice! We had a lot of fun together and became friends during the tour. It is very nice to do something different like a tour with some people. It makes you discover other faces as in the all-day life. What is it that will make you miss the tour? Once again the people who became my friends there, the food and the relaxing accommodations. I am actually travelling with my own money, which I saved as I was working. I use to keep my life simple, which makes it very affordable! Finding solutions or alternatives for sparing money makes you stay clever too. Furthermore, I think that money is not needed to be happy. Our life is the only things we can’t buy, this is why I prefer to work less and enjoy more! Any obstacles you faced during your stay in India? Until now I have been welcomed by Indians everywhere. The people here are more guest friendly than anywhere else in the world. The fact that they are curious and want to know anything and everything about me, is something that I have to manage every day. The avalanche of questions and requests for selfies are unbelievable! Due to the population density, it is nearly impossible to find a quiet place for camping in India, but you will find the most places accommodations. The traffic crowd and the smog are things I try to avoid. Therefore, I choose the state roads and avoid big cities. It is also safer to stay away from the dangerous bus and truck drivers! Tell us one funny memory that comes to your mind? As I was staying in Dandeli (North Karnataka), I became a friend of the resort crew, because I was the only guest they had. So we spend some time together: I visit few of them at there home, we played badminton and volleyball, went for trekking by night in the forest and we were also swimming in the river. As we travelled back from the river, we pressed us with ten people in a small rickshaw! The Indian music was loud in our ears and along the streets. We laughed a lot. It was simple and funny.